NASA's Terra satellite passed over Typhoon Talim and found a powerful storm with a large, open eye. On Sept. 14 at 0215 UTC (Sept. 13 at 10:15 p.m. EDT) the Moderate Resolution Imaging Spectroradiometer of MODIS instrument aboard NASA's Terra satellite provided a visible image of Typhoon Talim. 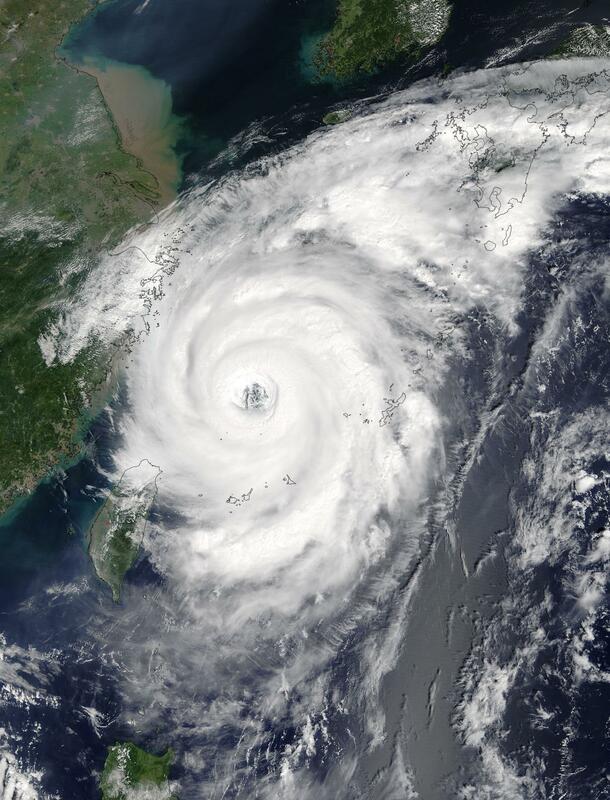 The image revealed a large, open eye surrounded by powerful thunderstorms as the storm moved through the East China Sea. The southern extent of Talim's clouds were over northern Taiwan at the time of the image. The Joint Typhoon Warning Center (JTWC) noted that at 5 a.m. EDT (0900 UTC) on Sept. 14, Typhoon Talim's maximum sustained winds were near 120 knots (138.1 mph/222 kph). JTWC expects this to be the peak wind speed for the storm. Talim is a Category 3 hurricane/typhoon on the Saffir-Simpson Wind Scale. Talim's eye was centered near 27.3 degrees north latitude and 124.3 degrees east longitude. That's about 191 nautical miles west-northwest of Kadena Air Base, Okinawa Island, Japan. Talim was also about 273 miles (440 km) away from southeastern Xiangshan of China's Zhejiang province. Talim is moving to the north-northwest at 6 knots (7 mph/11 kph). Because of its close proximity to China, China's National Meteorological Center continued to issue orange warning of typhoon at 6:00 a.m. local time on September 14. The Japan Meteorological Agency has already issued advisories for the storm at: http://www.jma.go.jp/en/warn/. Talim is expected to make landfall on the western coast of Kyushu, Japan sometime overnight from Sept. 16 to early Sept. 17. Talim is forecast to move in a northwesterly direction over all of the big islands of Japan through Sept. 19.